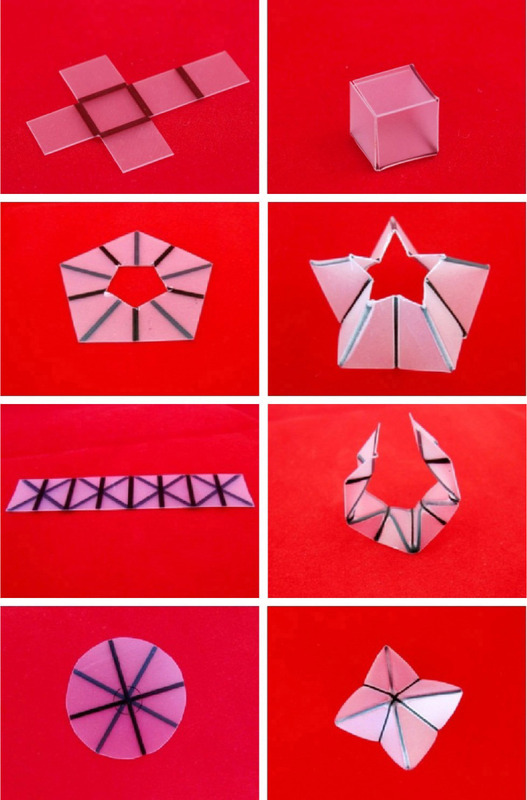 Here's a fun and simple example of a self-folding polymer, so simple that you can do it at home. Researchers at North Carolina State inkjet printed black lines onto polystyrene (PS) sheets and then exposed them to an IR lamp. The black preferentially absorbed the IR and caused localized heating in the PS leading to localized shrinkage on one side of the sheet. The result of these asymmetric stresses was buckling/folding of the sheet so that a 3-D object could be formed. You can see that by being creative and inking one side or the other that both peaks and valleys could be formed. Better yet, there is a video link at the bottom of the page. I can see this being an amusing toy for children; further practical applications escape me for the moment, but won't for long. This is too simple a technique to ignore. Well done.